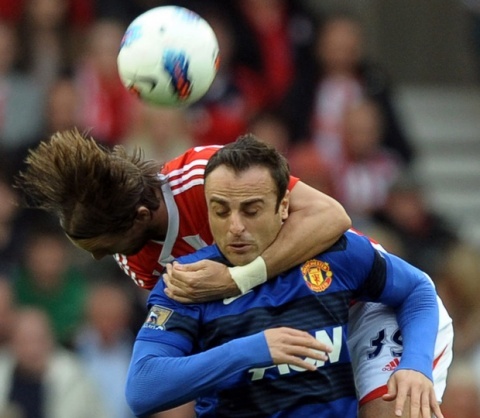 Bulgaria's top international striker Dimitar Berbatov has been nominated as one of "The World's Most Popular Footballer Amongst Currently Active Players in 2011." The striker of Manchester United and former captain of the Bulgarian national football team is one of the players nominated by the International Federation of Football History and Statistics. A total of 90 footballers have been nominated to compete for the IFFHS title, including 32 in Europe, 18 in South America, 3 in Oceania, 10 in CONCACAF Area, 14 in Asia, and 13 in Africa. The Internet users will vote for the most popular footballer of the individual continents between 8th November 2011 and 15th December 2011. Each of three first-placed players from Africa, Asia and the CONCACAF area as well as the each of the five first-placed players from Europe and South America - and the first-placed player from Oceania - will be the candidates for world vote. The IFFHS User vote of these 20 candidates between the 16th December 2011 and 5th January 2012 who will be the world's most popular footballer for the year 2011. In the IFFHS vote in 2010, Bulgaria's Dimitar Berbatov was selected as the most popular football player in Europe but lost the world vote to Iranian striker Fahrad Majidi, who currently plays for Esteghlal in Iran's Premier Football League.